Abstract: Airwheel has released several series of electric scooter, such as X series, Q series, S series and the latest A series. However, today the Airwheel editor will recommend the electric self-balancing unicycles which liberate the rider’s hands. Unlike traditional vehicles, riding Airwheel electric unicycle only needs the rider to stand on it, so that the two hands are free. Then more other things can be done while riding on the unicycle. It is acknowledged that the intelligent self-balancing scooter market grows fast and everyone wants to divide this “big cake”. Hence, the intelligent self-balancing scooter market is full of intensified competitions. Airwheel spares no efforts in meeting different needs and requirements. Through years’ hard work, Airwheel has released several series of electric scooter, such as X series, Q series, S series and the latest A series. 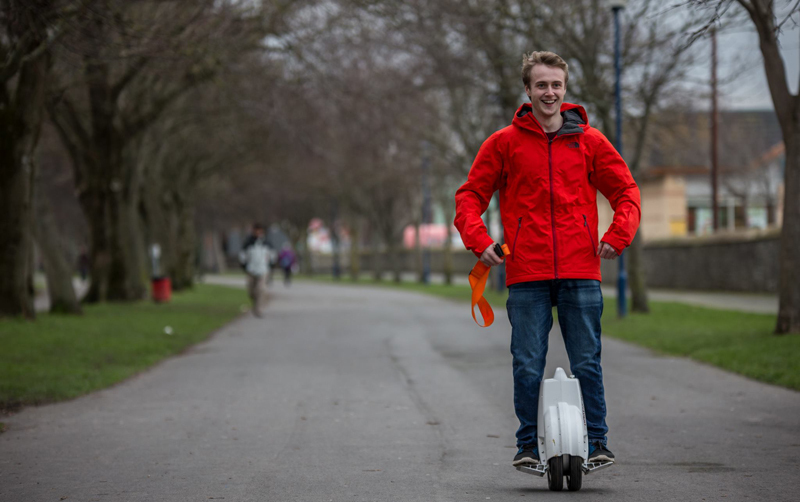 However, today the Airwheel will recommend the electric self-balancing unicycles which liberate the rider’s hands. Unlike traditional vehicles, riding Airwheel electric unicycle only needs the rider to stand on it, so that the two hands are free. Then more other things can be done while riding on the unicycle. It is controlled by mere change of center of body’s gravity, leaning forward or backward. Riders could do other things with their empty hands during riding. For example, daily commuters could carry handbags and in five-star hotels, the waiter can provide efficient service riding electric unicycle which in turn, it can become a feature of the hotel so as to attract more potential customers. Previous：Airwheel A3: a Sitting Posture Self-Balancing Scooter, Can You Imagine?